I have been a bicycle enthusiast since before I first began working as a bicycle mechanic at Brewster Bike Shop in 1990. After 10 years of working at Brewster Bike on Cape Cod, I decided to become an attorney so that I could help advocate for both cyclists and safer streets for everyone. I have been working as an attorney for the past 13 years helping injured cyclists seek compensation, protecting the rights of cyclists and working to improve bicycling in Massachusetts. In the 2012 case of Kopacz v. Wosney, I represented a bicyclist stopped and arrested by a State Police Trooper for nothing more that bicycling on Route 28 in front of the Science Museum. As part of the resolution of that case, I worked with others in the bicycling community to produce a training that was provided to all Massachusetts State Police Officers, detailing the rights of cyclists under Massachusetts law. I have represented plaintiff's at trial, in mediations and during settlement negotiations, recovering over a million dollars for cyclists hit by vehicles or injured when bicycling through construction sites in the last year alone. I am a former board member of MassBike, as well as a proud supporter of Bikes-Not-Bombs, Livable Streets and the Boston Cyclists Union. 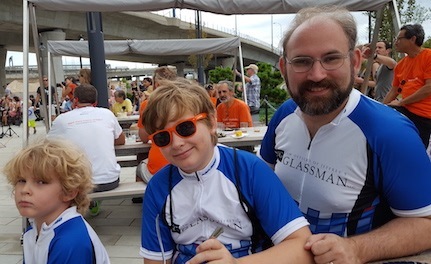 My son I and I have ridden, and raised money for, the Bikes-Not-Bombs Bike-A-Thon for three years running.